This short entry in the Wisdom of the East series includes a short introduction to Islam, and a set of topical quotations from the Palmer translation of the Qur'an. 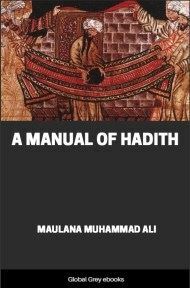 It covers subjects such as the Devil, Jinn, Marriage, Pilgrimage, Prayers, Fasting, Angels, and more. The Koran.—As the sacred volume of some 170 millions of the present inhabitants of the world, the Koran possesses an interest and importance which well merit, and will amply repay, attention and study. To the pious Musulman it is the very Word of God, the true rule of life, and the source of all his hopes for the future. It is universally allowed to be written with the utmost elegance and purity of style, though, of course, as the standard of the Arabic tongue, it scarcely comes within the pale of grammatical criticism. But, apart from this, it would be difficult to surpass the eloquence and beauty of its diction, and well may Muhammad have disclaimed all power of working miracles, trusting to the sacred Book itself as evidence of his mission from on high. 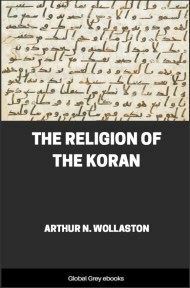 That the Koran was really the work of the Prophet of Arabia is beyond dispute, though it must be left to conjecture whether, and to what extent, others participated in his design. 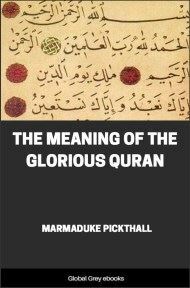 Pious Muslims, however, would have it believed that the book was of divine origin, and revealed to Muhammad on various occasions, sometimes at Mecca, and sometimes at Madina, during a period of twenty-three years. After the passages had been set down in writing by his scribe from the Prophet's mouth, they were published to his followers, some of whom took copies, more or less incomplete, for their private use, but the far greater number learned them by heart. The originals when returned were placed promiscuously in a chest, where they remained in a state of confusion till the time of Abu Bakr, the Khalif or successor of the Prophet (A.D. 632-634). By his direction they were collected and additions made of those portions which had not previously been committed to writing. Matters remained in this condition till A.D. 652, when Othman, who was then Khalif, ordered a great number of copies to be transcribed from the compilation of Abu Bakr; with emendations by specially selected scholars, and dispersed this new edition throughout the Empire, in place of the old collections, which were thereupon suppressed. It may interest the curious to learn that of the seven principal editions of the Koran which were subsequently prepared, two were published and used at Madina, a third at Mecca, a fourth at Kufa, a fifth at Bussorah, a sixth in Syria; while the seventh became the common or vulgar edition throughout the land. The first printed edition appeared in Arabic at Venice in A.D. 1530, under the direction of Pagninus of Brescia. The Pope of Rome, however, was alarmed, and by his orders all the copies were committed to the flames. The next complete Arabic edition was published at Hamburg (A.D. 1649) under the auspices of Hinkelmann. A later and more celebrated edition was printed at St. Petersburg in A.D. 1787 by command of the Empress Catherine II., for the benefit of such of her Tartar subjects as were Muslims. A Latin translation made in A.D. 1143, but not published till A.D. 1543, was followed after an interval of a century and a half (A.D. 1698) by the elaborate volumes given to the world by Father Maracci, the confessor of Pope Innocent XI. The first English edition of the Koran was the translation of Alexander Ross, which appeared at intervals between the years A.D. 1649-1688. Unity of God.—The great doctrine of the Koran is the Unity of God. It is true that at the time Muhammad remodelled the religions of Arabia the peoples of that land believed in one Supreme Deity —but they also paid adoration to the fixed stars and the planets, as well as to the angels and other intelligences which were supposed to reside in the heavenly bodies: while the worship of images, which they honoured as inferior deities, was carried to such an extent that there were no less than 360 idols—one for each day in the year—before which Arab devotees were wont to prostrate themselves. Muhammad the Apostle of God.—Assuming as an axiom which could scarcely be called in question, that there could be but one orthodox belief, Muhammad, finding that this eternal religion was in his time corrupted, claimed to be a prophet sent by God to restore the faith to its original purity. The aim was lofty, the conception magnificent; the religion of the "Faithful" was founded in humility—it reigned in sovereign majesty and might—and countless millions now worship the God of the Arabian teacher and ruler of men; while for thirteen centuries the vault of Heaven has resounded with the cry of Islam, "There is but one God—and Muhammad is the Apostle of God." Resurrection.—The next article of faith laid down in the Koran is a belief in a general resurrection and a future judgment. As soon as the soul is separated from the body by the angel of death—an office, so Muslims would have it believed, performed with gentleness as regards the good, and with violence in the case of the wicked—it enters into an intermediate state, there to remain till the last trump, save as regards the Prophets, whose spirits pass immediately after death to abodes of bliss. As regards the resurrection, it is generally believed that it will be alike corporeal as spiritual, and extend to all created beings, whether angels, genii, men, or animals. The dead, however, who have risen will not be brought to immediate judgment, but kept in suspense till such time—some would have it a period of no less than 50,000 years—as God shall think fit. According to Muhammadan belief the most exact justice will be meted out at the Last Day, inasmuch as a balance will be brought wherein all the actions of mankind will be weighed. When this terrible ordeal is passed, those who are admitted to Paradise will be gathered on the right hand and those who are destined to perdition on the left. Still the trials of mankind do not terminate with the ordeals which have been undergone, for all must cross a bridge which is said to be laid over the midst of the infernal regions, and described to be finer than a hair and sharper than the edge of a sword: it is also beset on each side with briers and thorns, so that unless directed and supported by the Prophet of Islam it is impossible to pass along in safety: hence the wicked, deprived of all guidance and help, soon miss their footing, and fall headlong into the abyss yawning beneath.